I have a bit of free time at the moment and I was looking at previous projects and what equipment I have available to me. I have couple of bench power supplies, an oscilloscope, a multimeter and a good stock of components for development. I still don't have a Signal generator! In previous posts I wrote about how I developed some addon circuitry for an AD9833 breakout board. 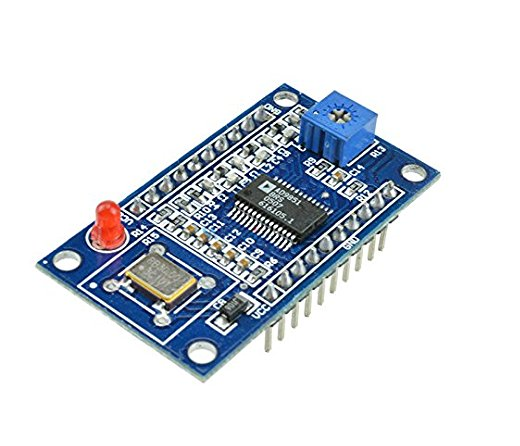 I never actually finished that project and I have since decided that there are better DDS signal generator breakout boards available. I bought an AD9850 breakout board from a maker-faire vendor at least two years ago and it has sat in my breakout boards pile for a long time! 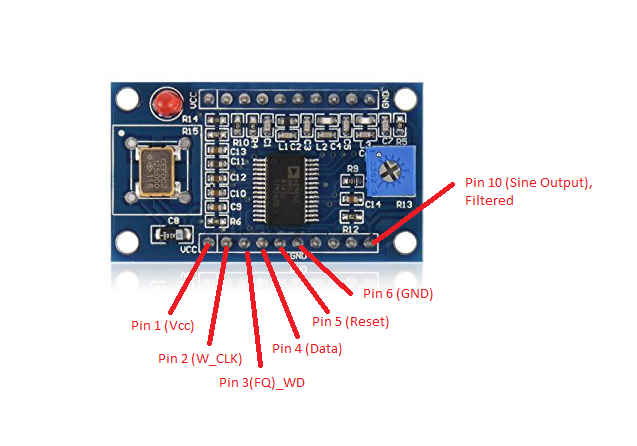 The number of projects and posts available for this board and how to use it are a testament to how good the device is and how easy it should be to use and get it up and running. I may yet build a simple scalar network analyser with one to allow for filter and amplifier testing at some point. For now I just need access to a signal generator. I should have finished the one I designed years ago or bought one off the shelf! The off the shelf devices that I see are all still quite expensive and don't have all of the functions I need. I could probably find one that did meet all of my requirements if I looked hard enough and was prepared to part with a little more money! The module itself costs £15.00 from various online vendors although I'm certain I paid less for it than that. As can be seen there is a filtered and unfiltered output. Obviously we want to use the filtered output and see what comes out of the unit. 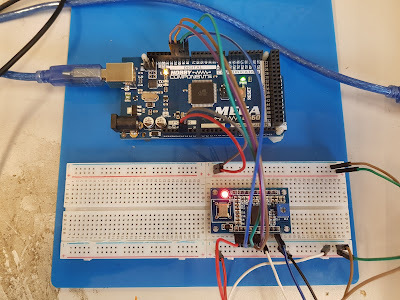 By connecting the unit up to an arduino and using example code we should be able to get the unit up and generating signals. From that we can design an amplifier and match the circuit to 50 ohms and hopefully put together a useful piece of test equipment in short order! The code will initiate the DDS module and then set an output of 1 kHz. 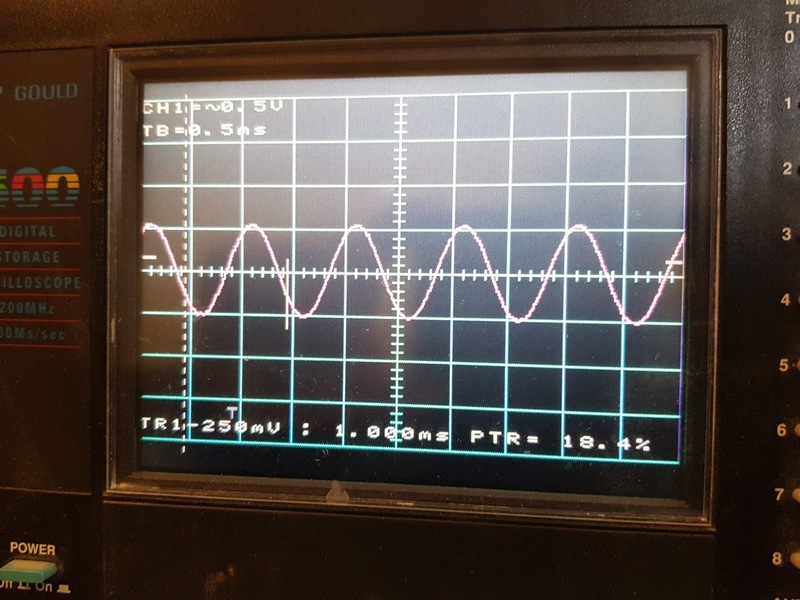 A nice clean 1 Vpk to pk, 1 kHz sine wave! The square wave output was also present and in good shape. I'm going to perform more testing to check the useable frequency range but so far so good. The frequency output is changed. That's all for now - Langster!